Back in the summer of 1989, I was 18 years old. I had my first "real" job of pumping gas at a nearby Texaco (later Esso) station. I was single and had been setting money aside from each paycheque, because I wanted to buy some sort of collector car. I had gotten the bug from my dad, and him from his dad. They both loved vintage Cadillacs. Between the two of them, they had owned over 10 of them (years between 1955-1965). My dad an I drove to St. Bruno, near Montreal one very hot summer day in my non-a/c 1984 Plymouth Turismo to look at a black 1956 Cadillac Sedan de Ville, almost exactly what my dad's first car was. I remember going through Montreal was brutal. We almost passed out because it was so hot and uncomfortable. When we finally arrived to look at the car, lo and behold, it wasn't exactly as the fellow had described to us over the phone (how many of us have experienced that!) There was no exhaust system on the car at all. I was able to drive the car at about 10mph around the block once. what a colossal waste of time. It needed a lot of work. Strike 1. So I picked up a copy of the Canadian Old Car Trader. I saw what was advertised as a 1959 Cadillac Fleetwood out in B.C. (I am in Ontario). The picture quality in the ad was poor and I asked the fellow if he could mail me some pictures of the car, so that I could confirm that it was indeed a Fleetwood. The Fleetwood had very distinctive trim along the side and I wasn't seeing it in the ad's picture. I know that on the door floor sill there is a stamped plate on many Cadillacs of that vintage, that says, "Body by Fleetwood". I just wanted to confirm this. He sounded offended and said he was positive that it was a Fleetwood and told me he wasn't going to send any pictures, despite my explanation. I never did find out about it. My dad looked through the Auto Trader a second time. This time he noticed a very subtle ad for a 1966 Pontiac Grande Parisienne in Edmonton, AB. It had a simple picture and very simple advertising. Well, as it turns out my dad was going on a business trip to Calgary. He showed me the ad and explained exactly what this thing was. I asked if there was any way that he could go check on this car. He phoned the seller up and arranged to meet. My dad rented a Chevy Sprint and drove it at 140km/h up to Edmonton. I got a phone call that night from him. He told me, "Kevin, don't even quibble about the price, just buy the damn thing". So, on September 6, 1989, money exchanged hands and I was the proud owner of a collector car. My dad arranged to have the car shipped by train to Toronto, where we picked it up and drove it home to Ottawa. I have to admit, the first time I drove it, it took some getting used to. The first time I floored it, my hands nearly came off the steering wheel. The acceleration was amazing. My first year of ownership was spent driving it around with the guys (and a few gals!) . Doing some research on the car showed that it was built on January 13, 1966 and that the colour of blue on the car was not correct. It had a green tinge to it, instead of a bluey/purple tinge. Over the winter, I had the car repainted it's correct shade of Deep Sea Blue Metallic enamel. The car looks so much better to me. Another thing we noticed is that the car didn't run quite right. We found out that the cylinder heads were from a 1974 454 truck. We were able to find and purchase a pair of 1968 427 heads. The performance improvement was astounding. 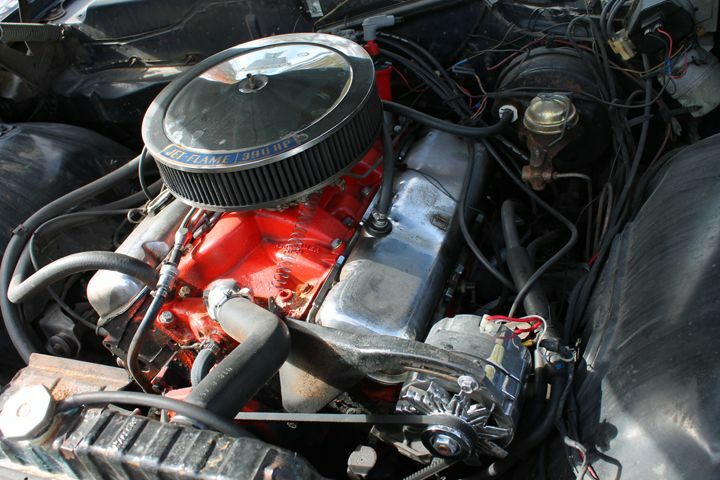 I have also added an Edelbrock Performer intake manifold and replaced the Rochester Quadra-Jet with a Holley 750. Back in 2012, I added electrically activated exhaust cutouts right after the Hedman headers. It is only supposed to be operated for "track-use" only, but I find it hard to NOT open them on highway onramps. 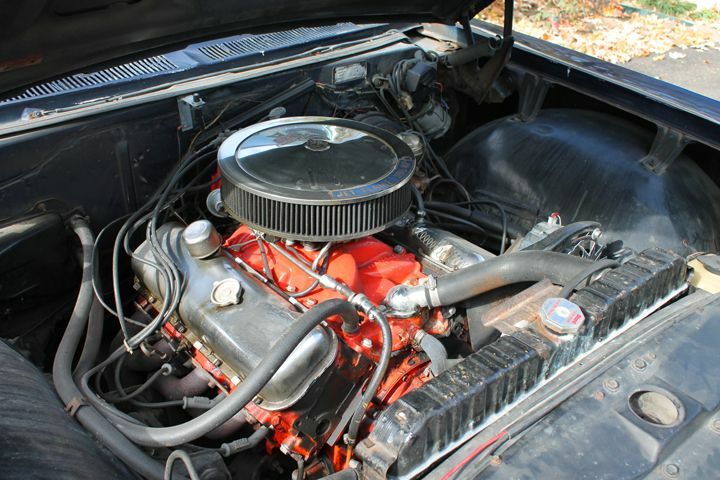 An un-muffled big block 427 lets loose a glorious sound. One of the nicest additions I have made was commissioning a set of custom performance redline tires and a correct period set of GM Rally 2 wheels with an embossed red PMD (Pontiac Motor Division) centercap on each. I have also added an L72 cam. The car and I have been on many adventures together. Surprisingly, I have never gotten a speeding ticket with it. I almost did one day, but was able to talk my way out of it. A cop was beside me at a traffic light. I must have been about 20 years old. Well, wouldn't you know it....this is the one time that I let the clutch out a little too quickly and the faintest "chirp" sounded from the rear tires as the light turned green. I drove at exactly the speed limit on that stretch of road. I noticed that the cop car had tucked in behind me. I had to make a right turn about half a mile down the road. This intersection has one of those merging lanes that breaks off the main road and onto the next. The next street had a slightly lower speed limit. I geared down into 3rd and I was in the merging lane to slow the car down and back into 4th once the car was aiming straight again. Almost immediately, the car throws it's cherry lights on and pulls me over. He told me that I was speeding because I didn't slow down. He didn't see my brake lights go on. I said that I didn't use the brakes and that I had used the gearbox to slow the car down. I don't think he liked that excuse too much, but he accepted it. He told me to be lighter with the gas pedal because I would save more on gas. Really?!? I was driving a big block 4000 pound brick. Fuel efficiency is not one of it's strong selling points. I have brought the car to the nearby drag race track before I had the exhaust cutouts, performance tires and the L72 cam. At that time the car ran the quarter mile in 14.2 seconds at 99.551 mph. With the improvements, I believe a time of about 13.7 @ 103-104mph is possible. In my mid-twenties, I started having issues with my back. My chiropractor said at the time that I needed a firm mattress and one way to achieve it was to buy a plank of wood and insert it between the box spring and the mattress. I went to the nearby Home Depot and bought a sheet of plywood (I had a double bed at that time). I was able to put it completely in the trunk and close the trunk lid completely! A retired fellow and his wife happened to be walking by and saw this. He said "Man...., you can't do that with today's cars". I certainly could not have fitted that in my Ford Tempo in any way! Back in 2007, I became a father for the first time. It was a dream of mine that my little girl come home from the hospital, not in my wife's minivan, but in the Pontiac. 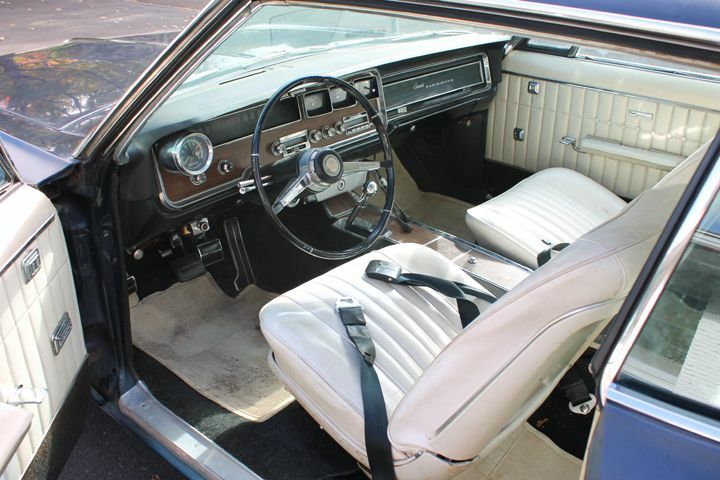 A 1966 Pontiac really isn't equipped with the sort of seatbelts conducive to installing a baby seat properly, but I managed to jury rig a system so that my dream became reality. My little girl came home from the hospital in style! My greatest adventure with the car has undoubtedly got to be when I ran it in the 1999 Cannonball Classic; a rebirth of the classic Sea-to-shining-sea New York to Los Angeles races of the 1970s, later made famous by the Burt Reynolds movies. I need to include a bit of history first. I am a huge Ferrari fan. My dad has an old 1968 365 GT 2+2. I am a lifetime subscriber to a Ferrari publication called "FORZA". Back in 1999, the Formula 1 editor of the magazine, a fellow named Andrew Frankl, mentioned in his magazine column that he had secured an invite to this rebirth of the classic race because he was an original participant of the classic races. The trouble is that his Ferrari was too new (a 328 GTS) and it would not be allowed to participate. The rules stated that the car had to be an original car from the classic races or be made before 1971. He put forth the question; Could anyone with an older Ferrari help out? So, of course I asked my dad. He must have been distracted at the time. He muttered out yes and that was that. I contacted Andrew and said yes, we could help out. We had an older 4 seater. We exchanged emails back and forth culminating in a email saying, "See you in New York". I told my dad. He only had a vague recollection of me asking. He said, "Well, I guess I had better get the car looked at". So, off the car went to the dealer in Toronto to get tuned up and looked at. The race was supposed to start on a Saturday. I had the pleasure of flying down to Toronto on the Thursday beforehand to pick up the car and bring it back to Ottawa. The car had never run better. There was one small (at the time) issue with the car, that nobody seemed concerned about. It was slightly hard to start. We just took it to mean that the car was being a little finicky, because the car doesn't get driven a lot. Anyway, I filled up the car and headed back to Ottawa. There is no way I could drive now the way I did that day. I would have the car seized, my license suspended, a monster fine and face possible jail time. This was probably the drive of my life. I made the 440km trip back to Ottawa in just under 2 and a half hours. I cruised between 180-240km/hr the whole trip back. I emptied the 90 litre fuel tank in just over 200km. When I had to fill up in Kingston, the car wouldn't start with the key. I had 2 burly guys push start it for me. When I got home, we found out that the starter motor had failed. Of all the rotten luck. The start of the race was less than 48 hours away. The editor of a major magazine was expecting us so that he could do an article on the car for the magazine. What were we to do?!? 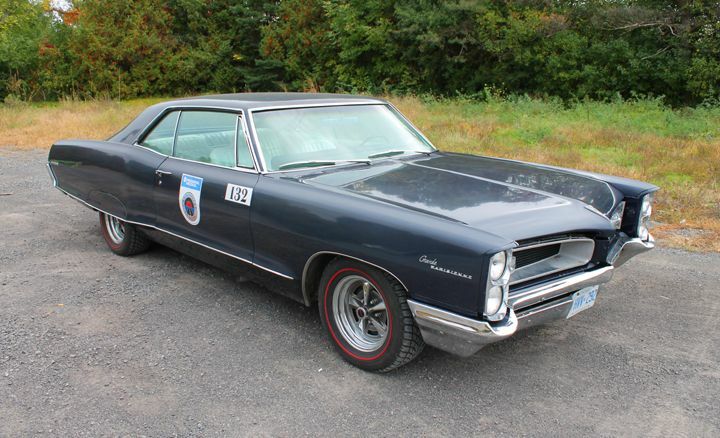 The decision was made that I drive the Pontiac down to the start in New York City, so that something would be able to run and my dad would meet us somewhere along the route, possibly around Detroit. Thankfully we have 2 world class mechanics close by who we had dealt with for a time (and still do!). They worked frantically to get the starter motor rebuilt and put back in on the Friday afternoon before the race on Saturday. Without even changing the oil or getting a tune-up, I loaded the Pontiac up with all sorts of tools and supplies and headed for New York City on the Friday morning. I managed to get to the Plaza Hotel after darkness had fallen. There was a gala dinner the night before at the famous "21 Club". We had a private room at the restaurant. I quickly checked in, through on my suit and ran to the restaurant. I was taken up the VIP elevator and was greeted by none other than Brock Yates! He introduced himself, "Hi, I'm Brock Yates". A little star-struck, I said something stupid like, "Yes, you are", I can't remember exactly. I asked him to introduce me to Andrew, which he did. We had a fabulous supper, as I regaled Andrew with the goings-on of the last 48 hours. I called my dad after supper. My mom answered the phone and said that the Ferrari was fixed, but my dad went to bed to get some sleep. He was going to get up super early to meet us at the start of the race. My dad started out at 2:30am! Without exaggeration, he got there 10 minutes before the start. The poor guy was half exhausted, but half adrenalized. Some quick introductions were made. As it turns out, Andrew decided to bring his son along. His son was starting a new beverage company called Phuse and had had arranged to have cases of the drinks delivered to particular points on the route. There was 12 cases sitting at the hotel. We ended up talking to Brock to ask if we could run the Pontiac and the Ferrari both. He had no problem with that. Within minutes of the start, I am hitting speeds of up to 80mph in Manhattan. Driving in Manhattan at 50 mph is pretty damn quick. Driving 80 is almost suicidal, but the noise reverberating off the buildings was amazing. Wouldn't you know it though...after a few miles, we see one of the organizers with his 1950 Caddy had thrown a fan belt. We spun the back end around in the middle of traffic and stopped to help.....hey we're Canadian...it's what we do! Remember earlier when I said the trunk is huuuge?!? Well, it is. I was able to carry not only our suitcases, but also the suitcase from another team as well as our tools and spare oil/water and 12 cases of this Phuse drink. The old girl never noticed any of the extra weight. One downside though was that running at the pace we were going, meant that we were emptying the fuel tank every 150 miles. For the first time in 10 years of ownership, fate struck again. It was the Pontiac's turn for a starter motor issue. We ended up push starting the car at each fuel stop from New York to Lincoln, Nebraska. We ended up stopping at an Auto Zone and found a mechanic to install it very quickly. In the meantime, I was starting to have trouble with my bowels and was getting sicker and sicker. My dad and Andrew even discussed shipping me home on the plane. I ended up having to rest in the back seat while other people drove the Pontiac. Later on I found out it was the sponsor drink "Phuse", that was causing the problem! The more of it that I drank, the sicker I got. It was supposed to be some sort of flavoured water with some additives. As I became more sick and more dehydrated, I was trying to replace the fluids I was losing. Let me tell you, there was no place that sold ginger ale in the middle of the USA back in 1999. I hope they do now. Coupled with push starting the car, I was exhausted. Anyway, with the car fixed, we were on our way again. One of the fellows to drive the car was a journalist from New Zealand. He told me this was only the 2nd time, he had ever driven a left hand drive car, the first time being a Corvette. He had teamed up with a British journalist and photographer from the British magazines "CAR" and "Thoroughbred and Classic Cars" . They were unofficial participants and were running a Subaru Impreza 22B. Think of a WRX STi Impreza on steroids. Only 7 of these machines were ever exported out of Japan out of a run of 400. They had gotten it from Subaru of America. This thing actually beat a Lamborghini Diablo through the Rockies. I had the pleasure of driving this thing for a bit. I didn't care how sick I was, I was not turning down a chance of driving something cool. The neat thing about this, is, when "CAR" ran their multi-page spread on the race and the 22B, the pictures of the 22B are clearly shot from my Pontiac and the driver of the 22B is me! The 22B is right hand drive. It was funny to see the other driver's reaction when the photographer was sitting outside the car on the window sill taking pictures out of the left hand window. They must have thought he was driving the car from outside with his feet! Later on, we played a game in the Rockies. Remember that I now have 3 people in the car and the trunk is packed with hundreds of pounds in extra stuff. We were at an elevation of 12,000 feet approaching Estes Park, in the Rockies in Colorado. The road is going quite steeply upward. We tried to see how low we could get the tachometer to go in top (4th) gear and then floor the throttle to see if the car would hesitate, bog or complain. Idle on the car is about 850-900rpm. We actually managed to get to 600rpm (below idle!) and when flooring the throttle, the car never hesitated for a second. It just pulled and pulled. While the Ferrari struggled a bit with the thin air of the Rockies, the Pontiac was a star and treated the Rockies like a parking lot speed bump. The journalists even wrote in the article about the Pontiac (yes, a feature was done on the Pontiac! ), "If you ever get your lorry stuck in a swamp, this is the car that will tow it out". It was relief to get to the finish line at the Portofino Hotel in Redondo Beach outside of Los Angeles. I gave the assembled crowd a bit of a show by coming into the parking lot sideways and a demonstration of Posi-traction with a medium sized burnout. A 3rd place result out of 25 worldwide entries and one of only 2 teams to not get a speeding ticket. An amazing showing for a car that I basically just jumped into without any preparation whatsoever. We even managed to get 2 trophies for our exploits. The Pontiac got the "Ab Jenkins" trophy. For those of you who don't know who Ab Jenkins was, he was the test driver for Auburn back in the 1920s and 1930s. He was the fellow that went out and certified that each supercharged Auburn Speedster built would achieve 100mph. If you ever get to see one "in the tin", look for the dash plaque certifying that Ab had tested the car. One of the organizers, Martin Swig, of the California Mille fame among other things, presented me with the trophy stating, " I was at my last fuel stop before the end of the race in my Cunningham and I see this beast had just fueled up. This thing took off out of the station and went from 0 to the next county in 9 seconds. The Pontiac became the first non-Italian car to ever have it's picture in "Forza" magazine. It was also featured in 2 different Japanese magazines whose journalists had also participated in the race. It was in the British publications "CAR" and "Thoroughbred and Classic Cars". Our local paper ran an full page article on my dad and I and included some pictures we had taken on the race. The story went out on the wire to every major newspaper in Canada and the USA, including as far as San Francisco. 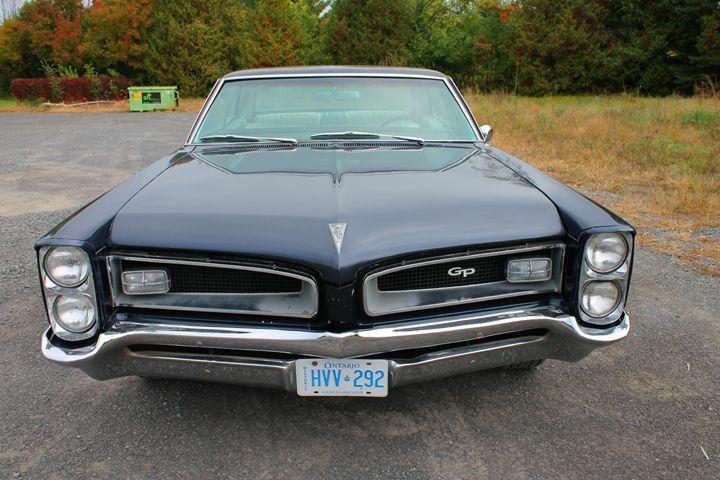 It has been in "High Performance Pontiac" and "Old Autos". 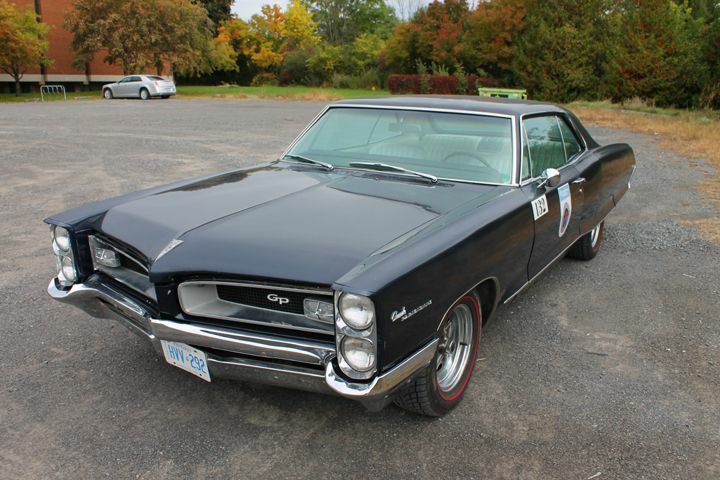 It may very well be the most published Canadian Pontiac in history! The car now has a little over 210,000 miles on it. It is not a trailer queen. The now almost 30 year old enamel paint has faded a bit and there are a couple of small rust spots that I will have to tend to. The car has never been driven in the winter, but the Ottawa climate must be one of the worst places to own a classic car. The humidity changes can be deadly to a car. 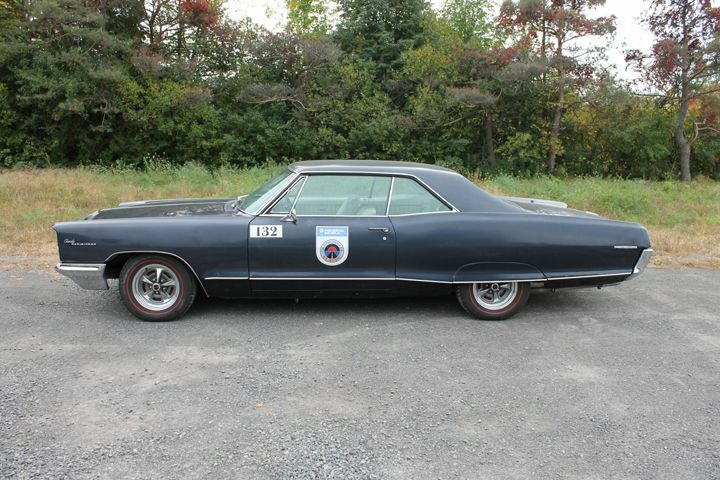 I believe it is 1 of about 80 big block/4-spd 1966 Grande Parisiennes made. What are my future plans for this car? Besides fixing the rust and the paint, I have 2 major things I would like to do. There is a company called Gear Vendors that have reliably been offering an application to modify transmissions such as the C4 and C6 for Fords, Turbo Hydramatics for GM and the Muncie M20-M22s amongst others. They can electronically add 2 extra gears to the car. I would like to turn my car into a 6-spd. Right now, my car is running about 4000rpm at 80mph. I would like to do more highway driving/car trips with the kids with this car. This application would help make the car more drivable at highway speeds and not put so much stress on the car. The second addition I would like to make is to get Vintage Air to install a trunk mounted a/c unit. Then I would have the world's first 1966 big block 6-spd a/c Grande Parisienne. I don't plan on ever selling the car, so it would still have a stock appearance, but it will be so much more enjoyable to use. My kids tell me they would love to inherit the car when I die....which I am hoping is not anytime too soon. (Carl, do you now see why I can't sell you the car back lol?) She has become a member of the family and is affectionately known as my mistress. Well, that's the story for now. I'll be sure to keep you all updated on the future developments. Keep the shiny side up! WOW is that ever amazing, both the story and the car! Amazing to find that car after all those years......these are 2 tons of fun to drive. Unbelievable story and car and you deserve to be proud of it. I can see why youve forgotten whatever Caddy you may have bought. You can bet I'll be posting here tonight when I get a minute! Congratulations Kevin, this is going to be fun! Prolly still have the Auto Trader around here somewhere......I thinking the asking price was around $6500? It just goes to show that we have lots of Canadian Ponchos out there, with their stories not told. Great car and a great read ! Awesome car, great story, and the fact it has so many real miles on it is astounding! Oh my, do I ever like your car!!! Great story and quite the adventures that you and your family have had in the Grande! Racing across the US and being featured in foreign auto magazines is truly awesome! Great story, terrific, very exciting car. The most amazing thing is that considering it has been in Ottawa for the past 30 years this is the closest I have gotten to it. Thanks for sharing Kevin, hope to see you around town sometime! I had the pleasure of travelling to Greensboro NC (from Morris) along with Carl when he owned the car to attend the POCI convention. Great memories ! Awesome car! I was quite ill on the return trip and spent many hours fully stretched out across the back seat... I wasn't drinking the phuse though. Very enjoyable read with the holy grail of 66 Canadian Ponticas as the centre piece. I laughed when I read the Cannonball magazine story and it talked about Kevin lying down in the back seat when he was sick. I instantly thought of you and the trip home from POCI! Kevin, I have virtually no spare time the next few days but when I get a chance I will sit down and fill in the blanks as to the history of the car before you got it (for those who care, and for those who haven't already heard it from me a thousand times before)! 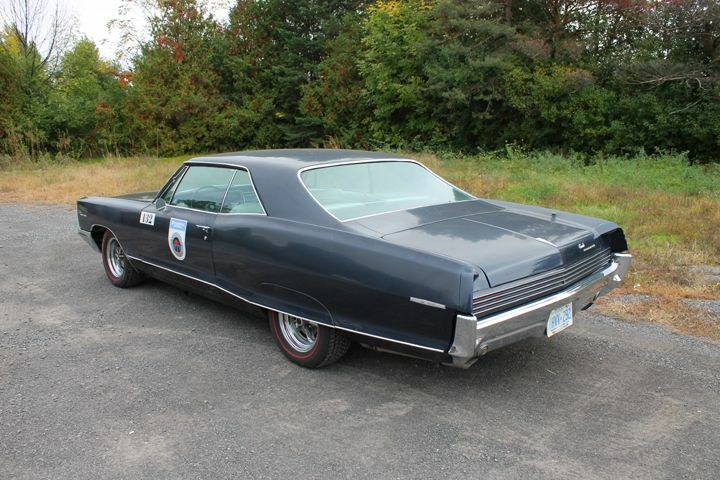 The real story I want to hear is what on earth ever compelled you to sell this 1 of 90 Holy Grail of Canadian Pontiacs? On the other hand I suppose its great that you did otherwise we wouldn't have had the chance to be regaled by this awesome Cannonball Run story. Way to go Carl, pure genius. Actually, my wife hated big cars then. We were newlyweds at that point. 30+ years later she appreciates big cars a lot. This is the one and only car I've ever sold that I regretted my move later. However, I'm delighted with the 66 I have now, and I'm delighted this car is in the hands of someone who realizes it's a very special car. And more on that later when I tell the whole story which includes me selling to the person who eventually sold it to Kevin. Awesome car and great stories associated with it. This is the kind of stuff that keeps me glued to the hobby. I've read Brock Yates' book "Cannonball!" and found it to be a great read. However, you actually lived it - who gets to do that? Too bad about the part where you were ill, but it does make for a great story in retrospect! Beautiful color scheme! Really suits that bodystyle, one of the few years that the Canadian version actually got the Grand Prix unique roofline. Great story about a very rare car.Can't wait to read Carl's addition to the car's history. What a beauty in so many ways.............. and you drive it! What good are any of these vintage vehicles if they are not driven. Collecting dust in the garage is no fun anyway. Enjoyed your write up and i appreciate your attitude. Continued good luck with that fine 66 427 of yours. Cheers. Great car and great read. One of the aspects of this hobby that I really like is the stories of the ownership trail and the stories associated with the cars history. As Paul Harvey used to say, "Now, the rest of the story"! As many of you, I was owned this car from July 1981 until a bitterly cold day in January 1989 when I watched it drive away heading for it's new home in Edmonton. I originally spotted this car for the first time on Portage Avenue in Winnipeg in late summer 1980. A friend and I used to drive the hour to Winnipeg downtown and cruise up and down Portage which is what all the guys with the "cool" cars did. On this night, we were driving my black 427 TH400 66 Grande Parisienne when we spotted a 66 Grande Parisenne parked in front of a restaurant/bar. Of course we had to stop and look. I walked up on the sidewalk side, looked in and the first thing I saw was the factory tach. My brain instantly said "4 speeds all have factory tachs" and my eyes dropped down to the console. Sure enough! Crazy as it was to do, I lay down and managed to get enough of a look underneath the front end to know it was a big block. Nobody in sight, didn't know where to look for the owner so I left a note on the windshield to the effect "If you ever need parts for your car, call me, I have some parts cars" and left my number. The following spring, I was cruising through Assiniboine Park in Winnipeg (another place the cool cars went) and at one point there is a break in the trees where you can see out to a street that runs by the outside of the park. Guess what I saw go by on the street! Yup, the blue Grande Parisienne.... I was not near a park exit but drove like a madman to the exit and headed west down the street even though by now we were like 2 minutes behind him. Fortunately, about a mile or so later, we saw it pulled in at the pumps getting gas. I got out to contact the owner, (also named Carl!) and when I told him who I was he said he had planned to call me because he needed a mirror. I inquired if he would be interested in selling and he said he would call me in a day or two, which he did. I paid the exorbitant sum of $2500 for a two owner 120,000 mile 66 Grande Parisienne 396 4 speed with tinted glass, power windows, F40 suspension, positraction, rear speaker, power antenna and the absolute coolest thing of all, factory transistor ignition (which I have never seen on another Canadian car). The car was all original paint except for one front fender, and Carl confessed he had a minor incident with it on an icy street one day. There were a lot of tiny parking lot dings along the body lines because he drove it to work regularly. The original owner was his uncle, or great uncle, something like that (same exact story as my 3rd owner Strato Chief)! I drove the car often in the summer over the next 8 years, rolling up about 40,000 miles. Over that time I added a number of factory options, AM/FM, reverb, power trunk, power bucket, reclining passenger seat, 4 way flashers and a tilt/telescopic steering column from a 66 Caprice. 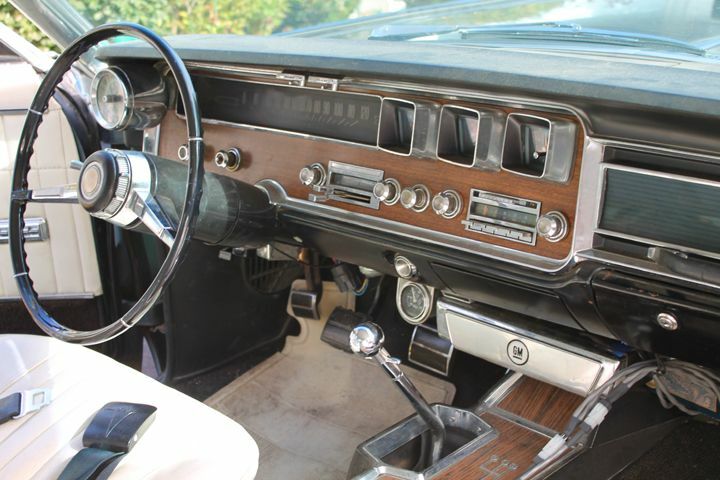 I also put in the 427 that you've heard me mention I pirated out of a 69 Parisienne convertible. And my memory is a bit hazy but I may have been the one who put on those 454 truck heads Kevin mentions. In the winter of 1985/1986 I stripped the paint off as it was in pretty poor shape. I was sad to do it but it really did need painting. I had it repainted the colour that Kevin hated so much when he got the car! Thankfully, he put it back to original colour. The car was painted and I put it all back together just in time to drive it to the POCI convention in Greensboro NC in July. Two friends came along, one of them being "Fake68" and he became deathly ill the night before we headed home. He lay in the back seat the entire 1600+ miles on the way home. It was cooking hot, the car has no a/c, so it was an adventure. We rarely were able to pass by a rest area as Gary needed pretty well every one on the Interstate! The car performed marvelously with it's fresh 427. It used very little oil, got about 16 mpg at around 3100 rpm and rode like a dream. We had no issues the entire trip. I had an absolute blast with it at the convention. While I only spent maybe 1/2 of my time with the car during those 3-4 days we were there, I spent literally every moment answering questions about the car. Some guys stood with me for an hour or two looking it over and wanting to know all about it. Saturday night was the awards banquet. Fake68 (Gary) was up in our room, deathly ill. My other friend Norm was with me but went up to check on Gary. While he was gone, John Sawruk from Pontiac Motor Division got up to give the award for the Most Interesting Post War Pontiac at the convention and I almost fell off my chair when he called out my name and asked me to come up for my award. It hadn't even dawned on me that I would get an award! And of course, neither of my friends was there to see it happen!!! In July 1987 I married the most wonderful woman in the world. At that time I had 5 cars. 2 66 Grande Parisienne 427's, 65 Acadian Sport Deluxe 427, 70 Skylark convert (GS455 clone) and a 66 Nova SS 327 4 speed. We needed money for a number of things. My wife loves to play organ and I loved listening to her play, so we sold all the cars except the Acadian and used the money specifically from the 427 4 speed car to buy an organ. I have never regretted making that sacrifice, she was easily worth it, but I have always said if I could have any of my cars back that I've sold, this car would be the one. When I sold the car in 1989, I could tell the buyer was not a real "car guy" and I was right. I went to Edmonton that summer and when I went to see him, he really had no interest in the car, I could tell. I lost track of him and the car after that when his phone number wasn't good any more. I didn't even realize he sold it that fall until I saw a tiny black and white picture of what I was sure was my old car in High Performance Pontiac magazine. And it was listed as being in Ottawa but because they screwed up the names of the owners when they printed the picture, I was unable to locate them. I saw the car again in the magazine with the Cannonball Run but again, no clues to find it. When this forum started in 2008 I mentioned owning that car and thanks to some of you here, I was able to track down the car and the owners. I won't forget the night I called the number I had come up with and when Kevin's dad answered, I said something like "Do you own a 66 Grande Parisienne 427 4 speed?". When he said yes, I was elated to say the least. FINALLY!!! I am so excited to be in touch with the car again, and it's been an absolute blast getting to know the 2 guys and see the enthusiasm they have for this car. And the ride Kevin took me for in this car a bit less than two weeks ago...............UNREAL how hard this car pulls now for a big boat!!! They've made some great changes to the engine!